A workshop on “Urban Partnership Program – Strengthening local governments in Southeast Europe” will be organized by Urban Partnership Program of the World Bank and the Republic of Austria ( UPP II)on 02/11/2016 in Podgorica (Ramada Hotel, conference room Medun). 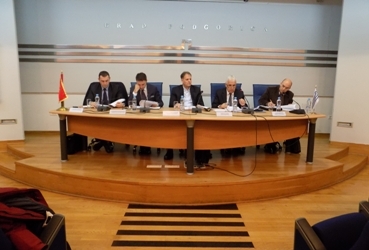 The third Assembly and the fifth Executive Board session was held on 22 January 2016 in Podgorica. The Assembly session was chaired by Mr.Slavoljub Stijepovic, President of the Assembly of the Union of Municipalities, and the Executive Board session was chaired by Mr.Aleksandar Bogdanovic, President of the Executive Board. The Proposal of the Union of Municipalities` Financial plan 2016 was discussed at a joint session of the Executive Board and the Assembly of the Union, presented by the Secretary General Mr.Refik Bojadzic. It was noted that the Financial plan for 2016 is prepared on the basis of data on planned and realized revenues and expenditures for 2015 and the planned activities that UoM will implement during 2016.